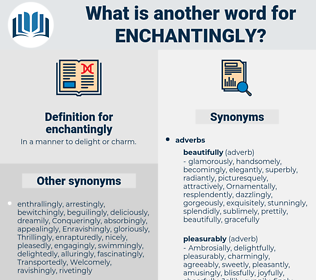 What is another word for enchantingly? In a manner to delight or charm. irritatingly, horrendously, terribly, Vexingly, appallingly, disgustingly, shockingly, ill, dreadfully, horribly, annoyingly, unpleasantly, awfully, disagreeably, badly, distressingly, sickeningly, abominably, vilely, horridly. There were strange noises in my ears, - the loud din of trumpets - the softer sound of harps played enchantingly in some far - off distance - the ever - increasing loud buzzing of the voices of the multitude - and then all at once the roar as of angry wild beasts in impatience or pain. She had grown very pale - enchantingly pale.